Whether you are looking for a therapeutic enhancement to your Cannabis remedies or whether you would like to unlock some of the healing and pain killing properties of Cannabis without using Cannabis itself, terpenes are a great addition to your wellness toolbox. For a list of the generally accepted therapeutic benefits of the terpenes found in Cannabis as well as other plants and herbs, Click Here. If you are using Cannabis medicine, supplementing it with additional terpenes, can be a great idea especially considering some if not most of the terpenes are removed through the process of decarboxylation. in the essential oils of various other plants other than Cannabis. You are probably already familiar with aromatherapy and now you probably have a much better idea as to why aromatherapy using therapeutic grade oils can be so effective for pain relief management. The easiest way to supplement your Cannabis remedies is by using a Diffuser. This is an electronic device that essentially vaporizes water and releases it into the air. It creates a pleasant aroma when essential oils are added to the water and a surprisingly significant amount will enter the bloodstream. You could also add them to carrier oil such as coconut oil for massaging the oil into the skin. These oils can be added to Cannabis infused topical lotions (these will not get you high). Another option is to simply add them to a warm bath to relax and relieve aching or inflamed muscles. Adding some Epsom Salts to your bath can help too. Please do not ingest these oils. Some are regarded safe to ingest but many are not and it is never advisable to do so. There are a lot of bad quality essential oils out there and many are not nearly as pure as they claim to be. This is not an aromatherapy guide so it is up to you to do your own research into brands. We have recommended the Young Living or do Terra brands (where available) simply because we have had numerous endorsements of theirs being quality products. Please do your own research. If you are interested in learning more about aromatherapy the Modern Essentials 9th Edition is a great book that explains things very clearly. It is sponsored by doTerra and ordinarily we would prefer to recommend a unbiased book but it is good enough to justify its inclusion in this guide. Please be aware that a very small percentage of the population could be allergic to one or more of these terpenes and it’s very important to test a very small amount on the skin first with carrier oil. These essential oils are extremely concentrated so please follow directions very carefully and do not exceed recommended dosage. Grapefruit – (92% D-Limonene) est. Wild Orange (90% D-Limonene) est. Cypress (51% Alpha Pinene) est. Cistus (50% Alpha Pinene) est. Balsam Fir (50% Alpha Pinene) est. Frankincense – (38% Alpha Pinene) est. Galbanum – (55% Beta Pinene) est. White Fir – (25% Beta Pinene) est. Douglas Fir – (20% Beta Pinene) est. Copaiba – (50% Beta Caryophyllene) est. Helichrysum – (5 – 12% Beta Caryophyllene) est. Clove (5-12% Beta Caryophyllene) est. 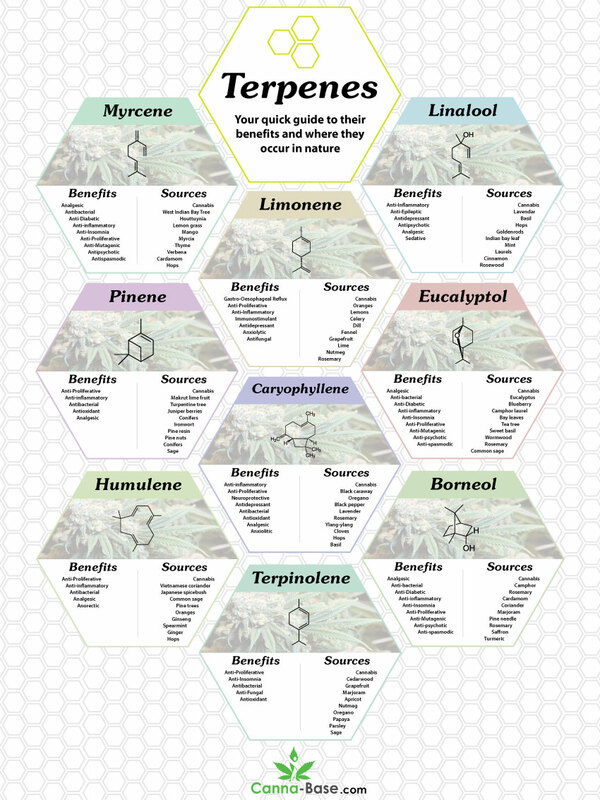 This infographic has been designed to illustrate the potential benefits of terpenes. Sadly this is a vastly understudied field which is a crying shame considering how many of these essential oils have been used therapeutically for millennia. This information is not intended to treat or diagnose any medical conditions. While we do believe in the power of terpenes we also are of the opinion that Cannabis contains ”safe” volumes of these terpenes. Not only that but terpenes appear to work synergistically with cannabinoids. This is often referred to as the ”entourage effect”. Essential oils are generally regarded as safe so long as they are ethically sourced and produced and the directions are followed diligently. Several terpenes can be toxic in excessive amounts and they should never be ingested. Essential oils are extremely concentrated and therefore extremely potent and should not be underestimated. Use them at your own discretion and please, if you choose to use them, use them responsibly.